Chicago Bicycle Accident Lawyer | Illinois Bicycle Lawyers at Keating Law Offices: Can the Illinois Bike Transportation Plan Reduce the Number of Bicycle Accidents in Illinois? Can the Illinois Bike Transportation Plan Reduce the Number of Bicycle Accidents in Illinois? This month the Illinois Department of Transportation has released the Illinois Bike Transportation Plan, a statewide initiative meant to improve bicycling in Illinois and make bicycling more accessible to residents in all areas of the state. It is the first statewide bike plan in Illinois history. Most notably, the Illinois Department of Transportation reached out to over 4,000 members of the general public for their opinions on how to improve conditions for bikers in Illinois and what areas to specifically target with their efforts. The Illinois Department of Transportation’s research indicated that concern about traffic safety is the single most prominent barrier to bicycling. Participants indicated that they would be more comfortable bicycling if Illinois increased the construction of the bicycle infrastructure to include more separated and visible bicycle facilities, incorporating improvements such as protected bike lanes, paved shoulders and green-painted pavement that designates part of a roadway as "bikes only." As a state, Illinois has been making efforts to become more bicycle-friendly. In fact, the League of American Bicyclists ranked Illinois as the ninth most bicycle-friendly state in the country in their last poll. This is a big jump indicating a steady increase; Illinois was ranked just 22nd in 2010, and then jumped to 11th in 2011 and 2012 before landing at 9th in 2013. Among the goals listed for the Illinois Bike Transportation Plan are increased safety for Illinois bicyclists by building separate and visible bicycle facilities, including bicycling in driver’s education programs and state driver’s tests, and developing programs to educate all roadway users on the rules of the road and bicycle safety; a more efficient transportation system that seamlessly connects bicycling with other common modes of transportation like trains, buses and the state transportation system; and greater community interest in bicycling as a commonplace option for daily errands, school and work commutes, and recreational use. As attorneys that concentrate our practice in representing bicyclists injured in bicycle accidents, we have strong opinions as to what can make bicycling safer. Without a doubt, from a physical standpoint protected bike lanes and even dedicated "bikes only" roadways that literally separate bicycle traffic from motor vehicle traffic are the most safe for bicyclists. The vast majority of bicycle accidents that lead to serious injury involve a collision with a motor vehicle. If the bicyclists and motorists are separated then the risk for bicycle accidents immediately decreases. From a non-physical standpoint the State of Illinois through the Illinois Secretary of State can continue to do more to incorporate the legal rights and responsibilities of bicyclists into the education and training that motorists receive when going through drivers' education and when they are re-tested for their drivers' licenses. Education itself can help increase awareness of bicyclists, the fact that bicyclists are legally entitled to all the rights and responsibilities as any user of the roadway, and serve as a chance to remind motorists to "share the road" and to "look" for bicycles. The Illinois Bike Transportation Plan is a promising program that looks to bring a lot of improvements to our state for bicyclists. The program is a step in the right direction and, if all of the goals are implemented, bicycling should be safer and we can hopefully see the number of bicycle accidents decrease. But there is always room for improvement when protecting bicyclists who are some of the most vulnerable users of the roadways. As a state we can always strive to do more and to be better users of our roadways. 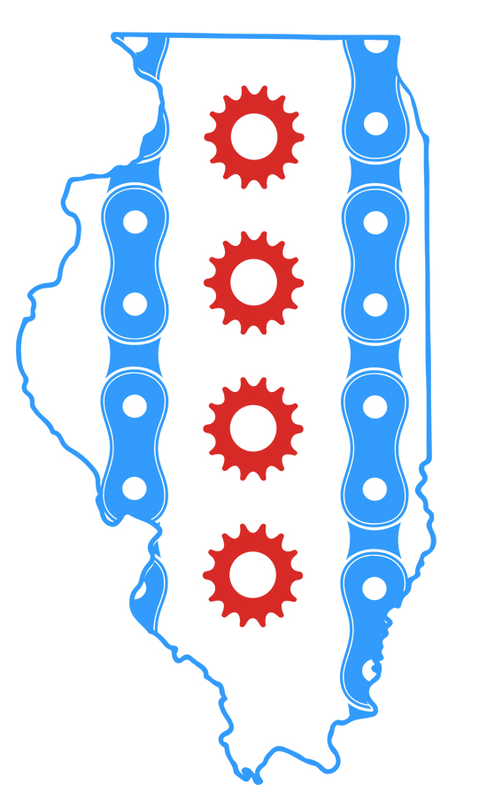 The Illinois Bicycle Lawyers of Keating Law Offices, P.C. may be found on the internet at www.KeatingLegal.com. The firm is located at 79 West Monroe Street, Suite 1024, in Chicago, Illinois. Phone: (312) 239-6787. Email: Info@KeatingLegal.com.